Arthur Moeller’s career enthusiastically embraces old and new musics. 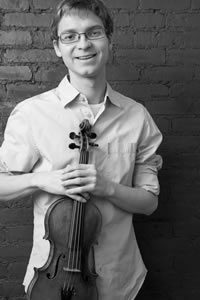 He has appeared as soloist with the Pittsburgh Youth, Westmoreland, and Johnstown Symphonies, has toured Europe, China and the U.S. as a member of small and large orchestras, and has given chamber concerts in Carnegie Hall, the Sculpture Garden at MoMA, Jordan Hall in Boston, and Harris Hall in Aspen, CO. He accompanied the band Vampire Weekend on Saturday Night Live and Late Night with Jimmy Fallon, he was filmed to create a moving hologram that featured in a RATATAT tour, and he performed for several years in and outside of New York as a member of the Pierrot ensemble Lunatics at Large. Arthur is from Pittsburgh, Pennsylvania. He studied at the Juilliard School under Naoko Tanaka, Cho-Liang Lin, and Ronald Copes, and continues to live in New York City. He plays frequently with the Princeton Symphony, NOVUS NY, the Paragon Ragtime Orchestra, and also recently held a Radio City Christmas Spectacular chair. In addition to his performing career, he maintains a professional portrait studio (www.arthurmoeller.com), and has photographed hundreds of New York Fashion Week runway shows.